Ellfive colony won its independence in the One-Day Revolution, but while much may be forgiven, its debts haven’t been. The orbital nation needs a serious supply of minerals and ore to realize its manufacturing potentials, and in this solar system, the cost of lifting rocks to orbit is prohibitive; the only viable option is to mine them yourself. And so, Star Svensdotter leads a prospecting expedition to the Belt, almost two AUs out, on the very edges of Earth’s colonization of space. It’s not exactly unexplored territory - a motley assortment of grifters, drifters and fortune-hunters have already made the Belt their home - but Star and her crew soon find that they have a lot to offer the anarchic frontier society, and that there are richer opportunities than merely mining for minerals. 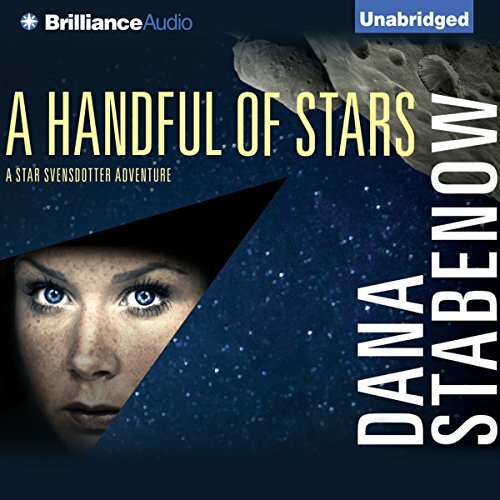 The second in Dana Stabenow’s Star Svensdotter trilogy, A Handful of Stars follows humanity’s outward migration into the solar system. ©2012 Dana Stabenow (P)2012 Brilliance Audio, Inc.
reviewed 2nd Star and series. liked elements but can't in good conscience recommend the series, or at least with reservations.